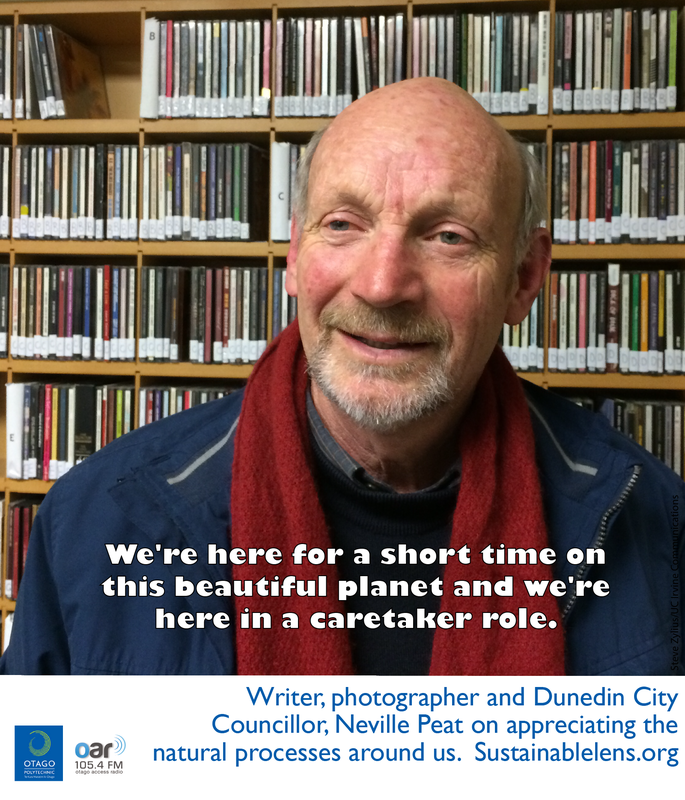 Neville Peat is a writer and photographer, and a Dunedin City Councillor. I’ve always enjoyed conveying stories about our landscape, and issues of the day. Growing up we weren’t really conscious of the wildlife on our doorstep. You’re telling a story, trying to convey ideas. It’s about finding an angle, describing what you see in as few words as possible, my most recent effort (in the ODT) described the Milford Track as “mountains of water”. The environmental movement was continually banging its head up against applications for resource consent for this that and the next thing…so we set up an organisation that could carry the message of sustainability or doing things good for the environment through the Green Business Challenge, that became the Dunedin Environmental Business Network. The idea was to get alongside people in business. This was a new way of working, we weren’t just banging on doors and writing submissions, we were working proactively to get our message across. 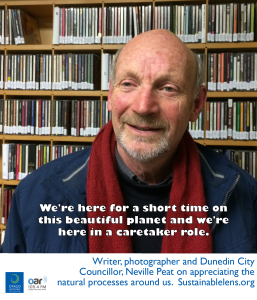 This led to the Otago Regional Council – I knew I could make a difference. We set up a Biodiversity Committee, the first in NZ, I was chair of that. But in my nine years in the Regional Council, I can only think of two good examples of sustainable management of natural resources based on a scientific tool. (Tussock burning based on 3 tests: coverage density, dry weight matter and height). Here at last, I thought, we can actually measure whether this classic snow tussock grassland would actually be sustained. (Secondly, irrigation allocation in the Kakanui catchment). The Regional Councils are primarily responsible for the sustainable management of natural resources, you would think a whole range of tools to help them, but really they haven’t. They continue to monitor decline in a whole lot of areas, without giving us a way forward, a tool, something we can grasp. (Is there a formal way of considering future generations in decision making?) Only if you keep waking up in the morning thinking “what’s the definition of sustainability? – it does include “without compromising the needs of future generations”. If you wake up with that you get a clear sense of your role. You are here not as a user, but a caretaker. It’s up to you to do your best. We are just here temporarily on a planet that is supremely beautiful. Often you get a moment of inspiration, a moment where it all seems right, its almost a mystical effect. It’s more effective to convey an idea than to say it…that’s what my work is all about conveying an appreciation of nature. The Dunedin draft Environmental Strategy is setting the scene for future generations. How do we relate to this planet – because we’ve only got one. The Dunedin natural environment is unbelievably special. (Success in last couple of years?) New edition of Wild Dunedin. Environment Strategy. (Activist?) Not as much as I was. I’m still active. I’m working pretty hard really, but I’m not a foot soldier any more – I’m trying to be a bit more of a leader. (Motivation?) Nature has to be given full expression, the moment we have conquered nature in any form we lose the plot. The mysteries and mystique of nature have to be retained. When my ancestors came here in the 1850s they saw nature as something to be conquered. Now five generations later, I’m saying let’s embrace nature for what it is and not as something to be beaten down. (Advice for listeners?) Wake up each day and salute the sun if it’s out, appreciate the natural processes around you, We’re here for a short time on the planet and we’re here in a caretaker role.